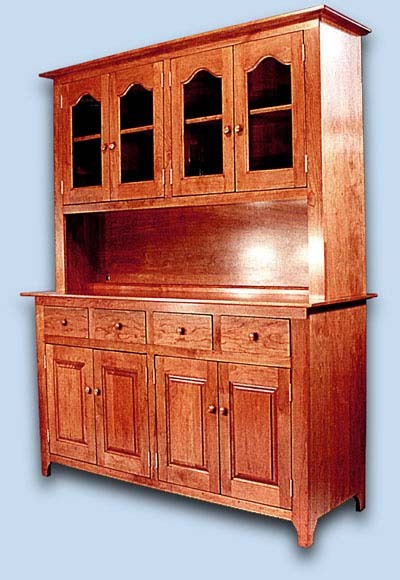 The traditional styling of this beautiful Shaker china hutch is timeless. Made of solid cherry, it features four cathedral glass doors with one shelf behind and a large open serving area in the hutch section. The base of this hutch has four dovetail drawers and four raised panel doors with one shelf behind. The dimensions of the hutch are 60" wide, 82" high, and 20" deep. We offer a large selection of hutches in all woods, birch, maple, oak, walnut, etc, ranging in sizes from three to eight feet long, with many different configurations of door, drawer, and style designs.